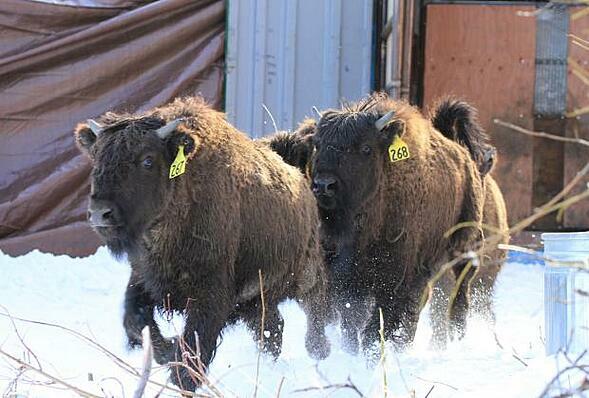 Lynden Air Cargo, Alaska West Express and Alaska Marine Lines were part of a major wildlife conservation project to relocate 100 wood bison from Girdwood, AK to remote Shageluk, AK in late March. Alaska Marine Lines donated containers that were retrofitted into 'bison boxes' to hold seven animals each. The animals were trucked from Portage to Anchorage for loading into Lynden Air Cargo's Hercules aircraft and the one-hour flight to their new home near Shageluk. The animals were nearly extinct at one point and have not lived in the Shageluk area in almost a century. Lynden companies donated containers, employees, equipment and discounted the flights to help the effort. 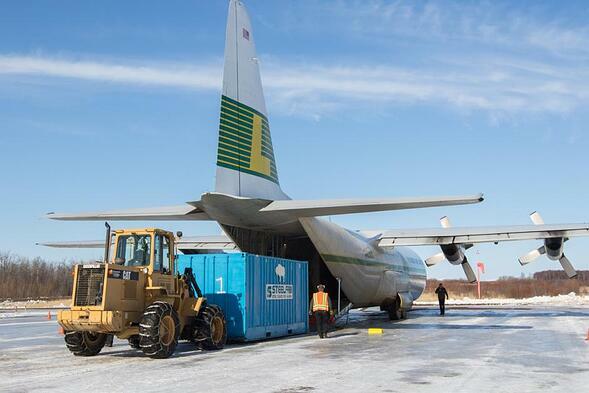 "Wood bison are the largest land animal in North America, and it took Lynden's Hercules aircraft, capable of landing on the short gravel runway at Shageluk, to transport them," says Jim Davis, Lynden Air Cargo Vice President of Marketing and Sales. "We have always been a niche operator, but this move made our top 10 list of unusual moves. We are proud to support this uniquely Alaskan effort." Lynden's commitment included Loadmaster Ike McGowan accompanying the animals on the flights and Director of Cargo Operations Jerry Stout loading the animals into the bison boxes at the Alaska Wildlife Conservation Center in Portage, AK. 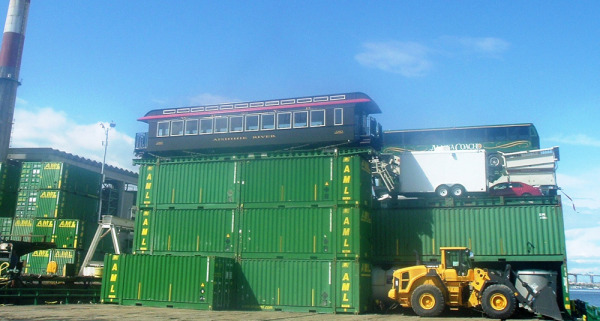 Alaska West Express Driver Doug Scott transported the containers to the back of the Hercules for loading in Anchorage. "It was a huge undertaking. The animals were brought in from the pens, then radio-collared, vaccinated and shuttled through a chute into the containers," Stout explains. 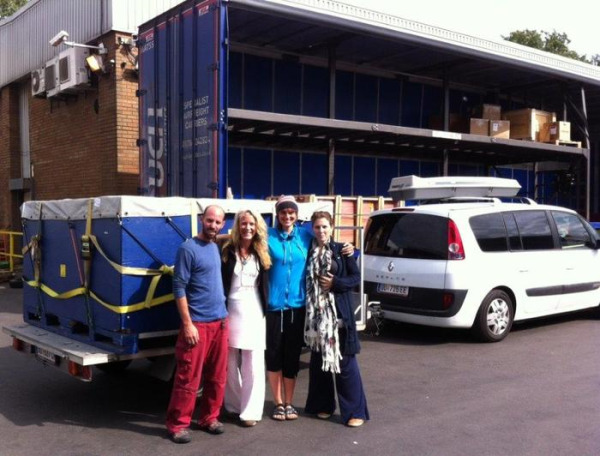 "We moved 100 animals with no incidents. All of them are alive and doing well." "It's been a privilege to work with the Lynden crew. They have been great partners, and we appreciate their support in bringing wood bison back to Alaska's wild," says Cathie Harms, Regional Program Manager for the Alaska Department of Fish and Game's Division of Wildlife Conservation. 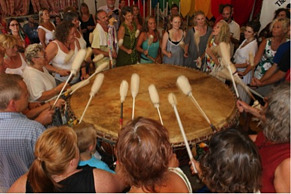 White Eagle Medicine Woman (Suraj Holzwarth) and the Grandmother Drum Ensemble have traveled a half million miles through 15 countries over the last decade drumming up support for world peace, tribal unity, reconciliation and earth sustainability. Lynden International has played a vital part in the Grandmother Drum International Peace Project by making sure the seven-foot, 1,660-pound crystal inlaid drum and over 1,000 pounds of performance equipment arrives safely and on time from one international stop to the next.